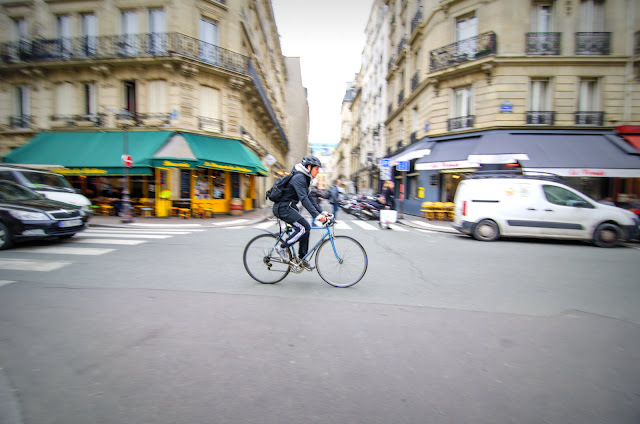 If you come to Paris, you'll probably see one of those many couriers on bike that move around town to take little parcels from one place to another. Most of them belong to company called coursier.fr (coursier means courier in France) that only uses bikers to avoid polluting when they deliver their customers' stuff . They even use little trailers - still pulled by biker - when the parcel is too large! I've always been intrigued by them; it takes a lot of "different thinking" to choose to use a mean of transportation that is slower and less profitable than what your competitors use! I love their philosophy ~ and I love the way you taken this so he seems to be standing still while Paris is whizzing around him! Happy Sunday, dear Eric. He can probably be faster than cars during the heavy traffic. Happy Easter, Eric! New York city has had bike messengers for years. While it is eco-friendly, they are also a danger to pedestrians. The bikers swoop past you while you're waiting to cross a street. Many a time I've had to jump out of their way! Merci every one. I'm actually just back from a trip to the Alps and did not even realize it was Easter!! That must be hard work, especially considering all the traffic. But you do get fit if you survive! We still have them here in the Philippines although most just bring mail or bills, more and more courier companies are switching to motorbikes. They probably picked the idea from Auckland, New Zealand!